MTSU researcher Walck earns Ch..
MTSU economics major Charlie Rogers is somewhat used to being noticed. Visit the Wal-Mart store on Old Fort Parkway in Murfreesboro and you may run into the affable customer service manager tooling around in his motorized wheelchair, working like all of the other employees of the perpetually busy big-box retailer. The 27-year-old Murfreesboro resident contracted meningitis at age 5, forcing doctors to amputate his limbs at the wrists and just above the knees. Refusing to give up, Rogers faced the challenge and is moving toward a bright future. Rogers drives a 2005 Chevrolet Uplander minivan, which is specially equipped with controls that enable him to operate the steering with one arm and the gas and brake with the other arm. At Wal-Mart, where he’s worked the past five years, Rogers started out as a greeter. He quickly grew bored with that role and worked his way up to a cashier’s spot. After moving into his current customer service role, Rogers so impressed store manager Tim Foxthat Fox recommended Rogers for a profile in a Wal-Mart employee-relations video campaign. 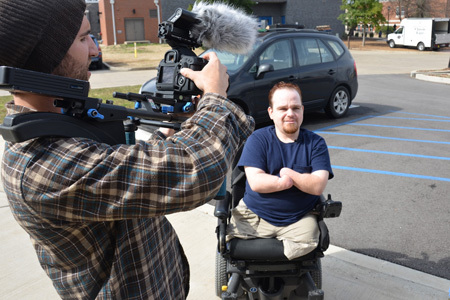 A filming crew from the Wal-Mart Stores’ corporate headquarters in Arkansas visited Murfreesboro in February to capture footage of Rogers in his work environment as well as on the MTSU campus, where he’s been taking classes since 2005. You can watch that video at http://youtu.be/UFDwjkL5eFo. An admitted technology junkie, Rogers said he uses his computer “a lot” to complete class assignments, though he does write with a pen or pencil on occasion. “I’m a lot faster at typing than I am writing,” he said. This video screenshot shows MTSU student and Wal-Mart associate Charlie Rogers talking to a store manager inside the Old Fort Parkway store. Click on the image to watch Wal-Mart’s video spotlighting Rogers, a customer service manager for the big-box retailer. Accounting professor Elizabeth Abernathy has seen Rogers’ technological bent firsthand, noting how he accesses lectures in her class via his iPad. The Wal-Mart filming crew followed Rogers to Abernathy’s accounting class inside MTSU’s Business and Aerospace Building. Rogers plans to take a class this summer before finishing up his degree requirements in the fall and spring to graduate in May 2014. He hopes his MTSU degree opens up more opportunities for him within Wal-Mart, whether in Murfreesboro or elsewhere. Abernathy said she believes Rogers “most definitely” represents MTSU’s “True Blue” spirit well.